The Press Room at Maracanã Stadium, where #worldcup2014 fever has turned these formerly law-abiding but ticketless #chile fans into a gate-crashing mob. 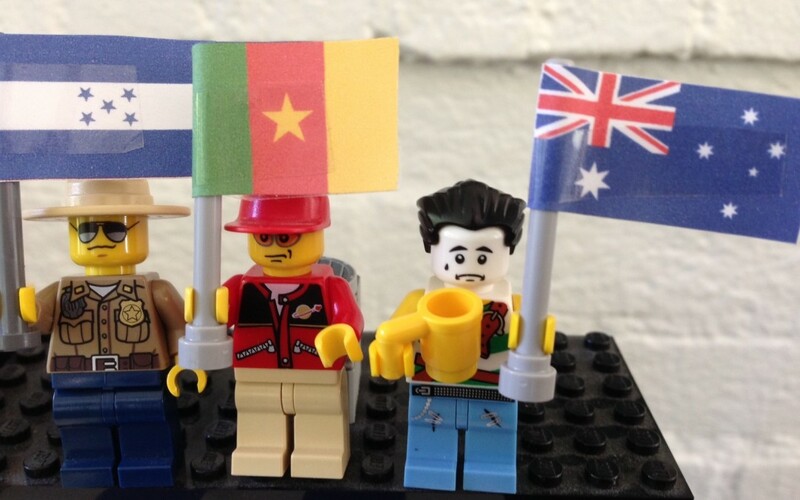 In keeping with my Lego takes on current events, I chose to portray the stampede of hundreds of ticketless Chile fans through the press room of Maracanã Stadium in Rio de Janeiro, on the day of their opening game with Australia. 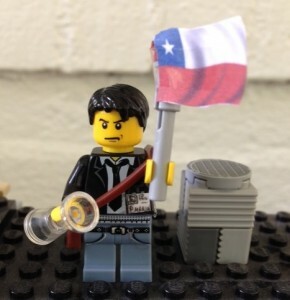 Chilean fans normally have a stellar reputation for sportsmanship and general conduct in international events, and a law-abiding reputation otherwise, so World Cup fever in a country so close by clearly showed its symptoms — and made for an amusing Lego setup. 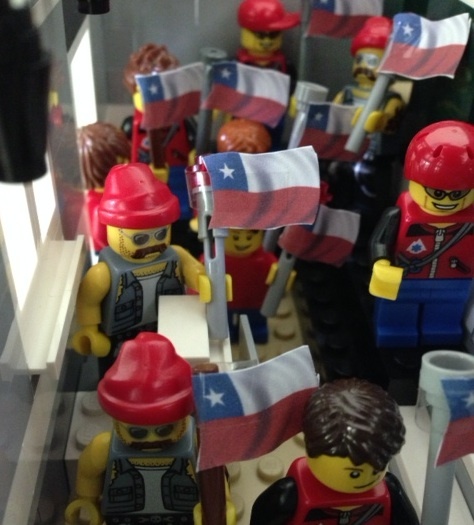 In the belief that obvious effort always gets recognized, I spent quite a few hours on my entry, printing out miniature Chile flags and attaching them to poles; matching clothes so every minifigure would have a red shirt, cap, or bandanna; disassembling my Town Hall to reveal the press room on the first floor; and setting up the little figures to show the movement of a fanatical mob as well as the presence of a young boy and his father in the thick of it. Then I took multiple pictures at different times of the day to get one with the correct lighting. The tightness of the space made it necessary to take that picture from above, but I thought it worked because it showed the crowd in the same way that they appeared in news footage from ceiling-mounted security cameras. Poor Patricio! His team lost! And #purowine, which offered discounts for every #chile goal yesterday, is charging him full price. I posted my entry, which received well over a hundred “likes” and dozens of comments. I checked the other entries. In all, there were about 20, from 10 different entrants. (I added a second entry, just for fun, but didn’t think it had enough relevance to the topic to win.) Given that the contest organizers would pick first, second, and third places and four honorable mentions — and strive to make sure no one won twice — I thought my chances of at least an honorable mention were excellent. Well, if seven people out of ten win something, there have to be three who come up empty handed. And I was one of them. It wasn’t as bad as the time I tried out for the girl’s basketball team in high school and was the only one cut, but it was close. But it motivated me to do something I should have done already. When I went to Seattle for the AWP conference, I met with several of the Brickcentral photographers, one of who has since co-founded the excellent toy photography website #stuckinplastic. Shelly offered to tutor me and help me edit my photos. And even though I know no one’s going to read my Instagram stories if they aren’t first drawn in by the photos — and great photography helps build an audience for a website as well — I let other things get in the way of asking Shelly for help. However, there’s nothing like coming in last place, or close to it, when you thought your work was just short of genius. So I contacted both Shelly and the two sponsors of the contest, who had also offered to give advice to entrants in the same way that judges sometimes do in writing contests. Fans lament the three World Cup teams that neither won nor tied a single game. From left, Honduras, Cameroon, and Australia. I’m sorry that Mark and Kristy have decided not to continue the challenges (which they announced before I asked them for advice), but I certainly appreciate their help. And I will be advising Shelly on her blog, specifically on the clarity of her explanations to newbies like me, at the same time as she works with me on improving my Lego photography. I don’t think I’m going to enter any more contest for a while, unless the organizers have similar tastes (in other words, no Star Wars Clone Troopers), are willing to comment on entries, and restrict entry to people who’ve never won contests before, thus weeding out the pros who tend to win all the time. For a beginner, it can be too frustrating and disheartening otherwise. This is a lesson for writers too. 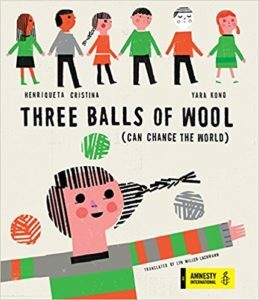 Often young writers and beginning writers of any age feel they have to submit to contests, agents, and editors when they’re not yet ready to do so. Especially for teenage writers, this can be the quickest way to drive them away forever, either because of the frustration of too many “no”s or a quick success that cannot be replicated. It’s also important to get critiques and find mentors, because, as I found out, sometimes you don’t know what you don’t know. Lyn, I’m sorry you didn’t place, but I’m glad you received encouraging feedback from photographers. You work so hard, Lyn, and I hope you can see the rewards for all of your hard work someday. Thank you, Linda! I mainly want to improve for the sake of the blog. When Shelby had her Disneyland blog (which along with yours was my inspiration), she’d make jokes about her bad photography and I’d tell her I was planning to race her to the bottom. Then, when I went to Portugal and posted pictures that people used for their sites and educational programs, I got the idea that having great original photography would be an asset for my blog. A fabulous post, Lyn. I personally thought your entry was genius. And I liked the ‘security camera’ view and the crowdedness and the details. It’s hard for me to imagine better, so I look forward to seeing where your photography goes. One of the professional photographers pointed out the danger of judging one art form by the standards of another. And I suppose a lot had to do with the focus of the contest. If it were specifically the Lego reproduction of a news event, I would have had a better chance. 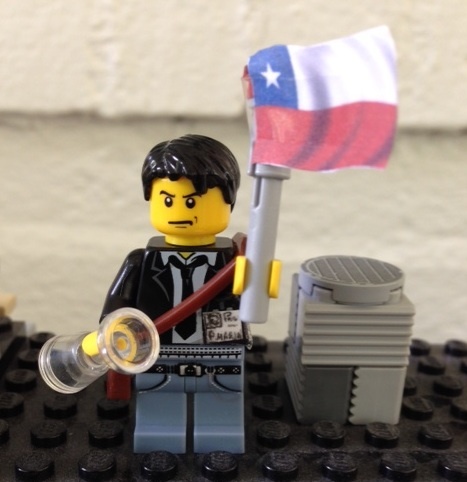 In fact, the one time I was recognized, it was in part for my use of Lego to portray accurately the Chris Christie George Washington Bridge scandal, and I’m sure my town’s resemblance to Fort Lee, NJ helped.